It’s been a while since I’ve written anything about my Cambodia trip. 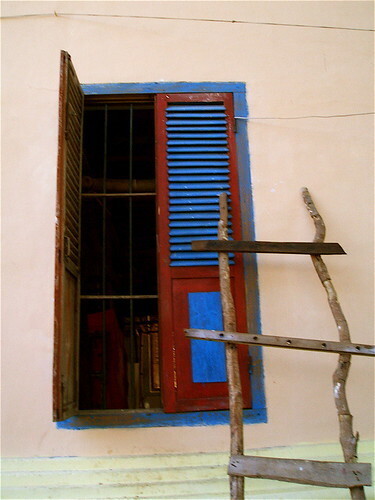 It’s been over 6 months now and I still haven’t finished downloading all the pictures from that trip into flickr. I put in another batch tonight and now I’m halfway through. While linking to those pictures, I’ve decided to reprint some parts of my journal from the trip. In this excerpt, I’ve put together some passages about our tuk-tuk driver, Mr. Vey. 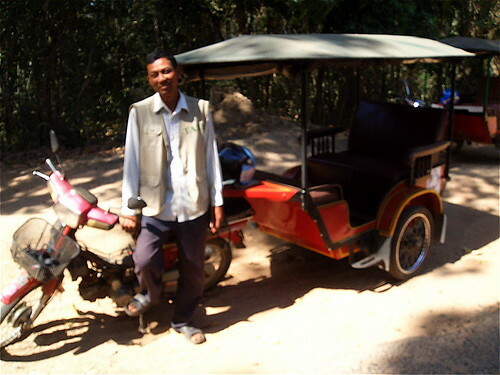 A tuk-tuk is a moped-driven carriage. I’ve seen them all over Southeast Asia. I was surprised that T wanted to travel around exclusively in them. They’re open to the wind, dust and exhaust. The ride is bumpy and in the early mornings it’s quite chilly. But T loved them and that’s how we got around. Thankfully, we had the good fortune to have a great, reliable, courteous driver. Our driver is a young-looking man named Mr. Vey (pronounced “By”). The hotel referred him to us on the first day, and we’ve been hiring him every day. We like him because he’s not aggressive, pesky or talkative. Most drivers try to arrange other trips or take you to shops where they get a commission. But he’s totally mellow. We like that. In fact, he seems reluctant to be hired every day. It’s almost comical. Maybe he’s doing pretty well already. Doesn’t need the money. Or maybe he doesn’t want to pick us up at 7:30 am. I know I wouldn’t. But he’s stuck with us. And leaving for the temples at 7:30 is the only way to avoid the heat and the busloads of the tourist hordes. On the second day, in a hushed tone he asked us to pick us up around the corner because the hotel charges him some amount. I’m not sure what the system is but the hotel staff appear to be very powerful since they can heavily influence where and to whom tourist dollars are spent. After a few days he warmed up to us and I started asking him questions about him. It turns out that he’s not so young. In fact he’s 38, a little older than me. He shook my hand when I told him my age. It also turns out he has a wife and two daughters, lives in a village near the Central Market, and has been driving for seven years. He couldn’t understand that I didn’t have kids. He asked me several times just to be sure. And then looked on us in pity. He has an understated sense of humor like when I asked to take a picture with him and he mimicked a street urchin and said, “one dollar, one dollar” with a straight face that broke into a mischievous smile. I get the feeling he’s a pretty sarcastic guy when he’s relaxing with his buddies. But he’s low-key about it. On the last day, he was supposed to pick us up to go to the airport. But, uncharacteristically, he never showed up. After an hour of waiting we hired another driver to take us there. After over a week of punctuality, we were afraid that maybe he’d gotten into an accident or had some kind of trouble. Hopefully he’s okay. Thank you Mr. Vey for driving us around safely! For more posts about Cambodia click here. For the burgeoning photo set click here.